St. Luke’s members are actively involved in giving back to our community through numerous ministries and programs. Here are a few highlights of the many programs in which St. Luke’s is involved. St. Luke’s is well known locally and regionally for its outstanding participation in a partnership with Bryan Elementary School, Adopt a Highway, Blankets for Kids, Bike & Build, Habitat for Humanity, KIVA Loans, and Jubilee Ministry. The parish organizes a monthly “Reverse Offering” which benefits local food banks and other non-profits. Parishioners bring in goods to donate to the receiving organization and at the end of each month, the goods are all donated to the supported group. It is a fun experience to watch the donations build and build each month, filling the area behind the last row of pews in the church nave. St. Luke’s buildings are used extensively for numerous 12-step programs, including Alcoholics Anonymous, Narcotics Anonymous, Women’s Narcotics Anonymous, Men’s Narcotics Anonymous, and Young People of Alcoholics Anonymous. The calendar of upcoming meetings is here. These meetings are open to anyone. See our monthly calendar here. The Village at Orchard Ridge (www.theorchardcda.org) receives annual financial support from St. Luke's and 18 other local Christian churches who form their governing body. It's mission is to provide a faith-based loving home that honors older adults. The organization was previously called Coeur d'Alene homes and began 97 years ago as a Lutheran orphanage. Orchard Ridge now provides a continuum of care ranging from independent HUD subsidized apartments for those over 62, to assisted living with memory care for those needing continuous care. It is the only faith-based, non-profit care facility in the area and its residents enjoy a 12 acre campus close to down town Coeur d'Alene on W. Harrison St. Farley Green and Virginia O'Connor are the new St. Luke's liaisons and will keep you up to date on the church's commitment to this outreach ministry. One offering is Estate & Moving Sales services as a means to raise money. Another is a Toolbox (binder) is full of resources and information from non-profit and government agencies that focus on Aging and Elder Care. The Toolbox is available in the church office and can used by all members who are aging or by family members, to help access valuable information to local services. Check out services here. Fit and Fall Proof classes are designed for those 55 and older, focusing on flexibility, balance and fall prevention. The class meets twice a week in the Parish Hall. The program is sponsored by Panhandle Health District and St. Luke’s Parish. St. Luke’s offers a community garden which is housed on the same block as the church. Each spring, members of the Parish and the community select a garden to maintain throughout the summer. The only charge is contributing a portion of the vegetables grown to the Shared Harvest Community Garden, which then distributes the proceeds to local food banks. To paraphrase Chapter 18 of Matthew, where five or six are gathered together in His name, he will be in their midst even if they are along the side of I-90. At least twice a year, members of St. Luke’s gather between MP 11 and 12 along I-90 for a special kind of ministry - to pick up litter. St. Luke’s Jubilee Outreach Ministry has been an Adopt-a-Highway participant with the Idaho Transportation Department since 2005. Those who participate don fluorescent vests, work gloves and armed with grabbers and orange trash bags – begin to worship in the great outdoors. All sorts of interesting items have been found in the ten years that members have participated – it is a dirty job, but always an adventure. A trophy is given each time for the most unique item found along the freeway. The Trash Trophy for the August event goes to the Rev. Glenda Empsall. Glenda found several wrapped packages, a plaque reading “Hug your Mom”, family photos and papers. She put all these items in a special bag and brought them home with her. Looking through the papers she was able to find a name and phone number. She called the owner and learned that the woman was in the process of moving to assisted living in Spokane when the items were lost. She was so pleased that they had been found and would be returned to her. SERVICE – one of our St. Luke’s Core Values. One never knows what opportunities to perform service, to be a minister will come our way – even maybe come along the freeway. Thanks to all those who have been a part of this ministry over the years. 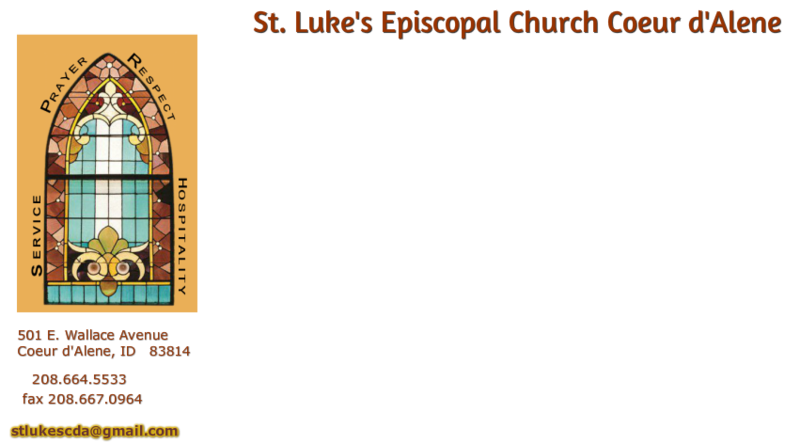 Every two years, St. Luke’s produces Episcofollies, a night of riotous fun to raise money for community organizations the parish supports. What is Episcofollies, you ask? It is some of the finest talent in theNorthwest – members and friends of St. Luke’s who are not afraid to act a little foolish and have some fun to raise money for good causes. Members of St. Luke’s participate in the Bishop’s Guild of The Cathedral of St. John Evangelist. The Guild was founded in 1929 to serve as a source of friendship and financial aid to the Bishop of the Diocese of Spokane, of which St. Luke’s is a member. Each year the Guild organizes two fundraisers – the annual Holiday Bazaar and the Spring Fling, both of which raise money to support the Bishop’s Scholarship and Discretionary Funds. Family Promise relies on a ‘Hospitality Network’ to fulfill the need for lodging and meals for the guest families. The FPNI network is a coalition of twenty unique partners representing an array of religious beliefs – from Episcopalian to Baptist to LDS. This diverse community of faith is instrumental to the success and invaluable to guest families during their transition. There are two levels of support which are offered based on an individual church’s capabilities, infrastructure, and level of commitment. The primary support comes from Host Churches which offer lodging and meals within their own church facilities. Other smaller congregations participate as Support Churches by providing meals and host volunteers at lodging facilities. These churches typically don't have the infrastructure to accommodate families directly. The churches take turns housing and feeding the families for a week at a time, with each family having its own room. Family Promise delivers rollaway beds and other amenities. Up to 3 families can be guests in the FPNI program at one time. St. Luke’s furnishes office and program space to Family Promise of North Idaho. It also supports Family Promise though many of its other fundraising and outreach efforts. Read the latest news on Family Promise here. The Parish also supports the Village at Orchard Ridge (formerly, Coeur d’Alene Homes). On the International level members of the Parish have traveled to work at El Hogar of Honduras, which it continues to support financially. As a congregation, we support Camp Cross, the Church Periodical Club, Episcopal Relief and Development, the Millennium Development Goals, and the United Thank Offering. Individuals within the congregation support these and many other Episcopalian ministries.